The kids are headed back to school. 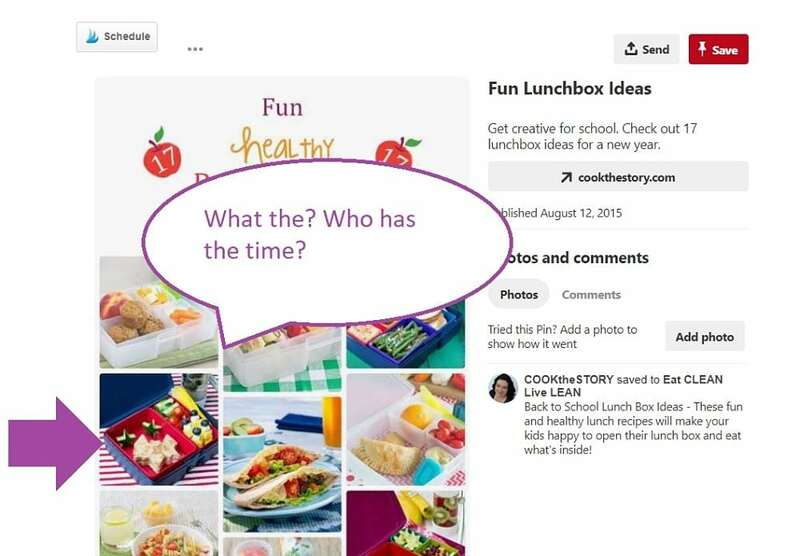 My Pinterest feed is full of “healthy lunch ideas” or “printables for the first day of school”. I just sent my oldest off to college and while I have many thoughts on that process, I want to share my thoughts on what NOT to worry about as you send your kids back to elementary school or even high school. With back to school shopping being the second Christmas of the retail year it’s very easy to get wrapped up in all the things you must have or you must do for your kids when they return to school. 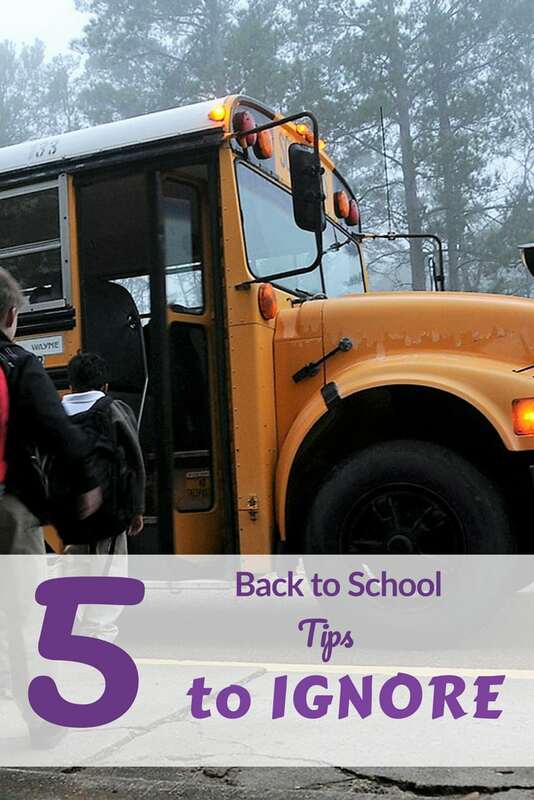 So here are 5 Back-to-School Tips to ignore for a an easier start to the year. Take it on the second or third day of school after you have figured out how to get out the door. It will be easy to do and in 10 years it won’t make a difference to the memories. It seems to be that every year the kids need a new backpack. Why? Did the one from last year break? If so, then yes get a new backpack. If not, just keep using last year’s bag. It doesn’t suddenly stop working because it’s now a different school year. I realize a new backpack feels like this yearly initiation for your child. It is also a fun experience to shop for it. But please for the love of landfills everywhere –don’t! They don’t need it and you can save the money. Plus if your 4th grader picked an Iron Man bag last year and now can’t stand the red-dynamo. It isn’t a reason to to get a new backpack. It’s a reason to learn to live with your trend-based decisions and reconsider them the next time the item is one you will use year over year –This is a life skill as anyone who has purchased cute but uncomfortable designer shoes for their “work wear” knows how learning to resist a trend is financially important. I know it’s ironic that I mention the things that are most popular to share on Pinterest, but seriously it’s a brown bag lunch. They don’t need a Bento Box with Olaf made of cheese. I don’t know about your kids, but mine threw their, aforementioned, not-new backpack around. They dropped it. They accidentally stepped on it on the bus (or in the carpool). Lunch became a jumbled mess. Plus we don’t need to turn lunch into a “my mom loves me more” contest based on how impressive printable jokes are you added. I personally gave my kids school lunch every day! I am a slacker. The school could put together a healthy assortment of food for less than it cost me and the kids were equally likely to throw it out if I made it or the school did–even if the cucumber are cut like stars. Most kids go back to school in August and early September (if you are fortunate). And it’s not cold by then in most places. I have lived in some of the coldest points in the US. That means that what your child wore on August 15th is probably going to be perfect for August 28th. The weather didn’t suddenly become fall. Buying sweaters and hoodies and lots of heavy pants at back to school clothes time isn’t actually the most practical thing. Maybe one outfit of early fall purpose is fine, but let’s not create and all new capsule wardrobe. Sure kids grow and clothes, but I don’t remember my kdis ever conveniently growing only in the summer or only just before a clothes sale. They grew all the time and constantly outgrew pants at the most inconvenient time (ie before the wedding reception or cousin Jenny’s baptism). You will be buying more clothes as the year goes along (especially if your tween just started the whole gym locker changing thing). Just don’t fall for all the back to school clothes ideas. I could actually go on about things like kids don’t need new everything. Don’t take them out to lunch in the middle of the day. Don’t be on the teachers bad side from the get go. Stop acting like going back to school is something the kids have never done and won’t do every year for the next 12 or more. But I will halt myself here and you can save yourself the hassle of these things when school starts again. It’s a shockingly simple transition. The first day of school is almost the exact same as the last day only you will be doing it again tomorrow. So please skip these back to school craziness. And in full disclosure we had an intern college student write some posts telling us her tips for going to college. If you want to check those out you can along with our other back to school information (not everyone complains like me FaveMom loves back to school enthusiasm more than me). If on the other hand, you want to hear me complain about more over-the-top frenzied stuff I can’t handle you can read my post about Bridal Shower games and planning.